Your Class Notebooks and all the pages and sections inside them are saved as folders in OneDrive. When you select one of your notebooks in OneDrive, your Class Notebook will automatically open in OneNote. However, it's possible to view the folder structure of your Class Notebook in OneDrive by following the steps below. Your folder structure will look similar to the image below with a Collaboration Space, Content Library, and private sub-folders associated with your students. Open a file or folder to see the notebook pages inside it. Your Open Notebook.onetoc2 file represents your table of contents. 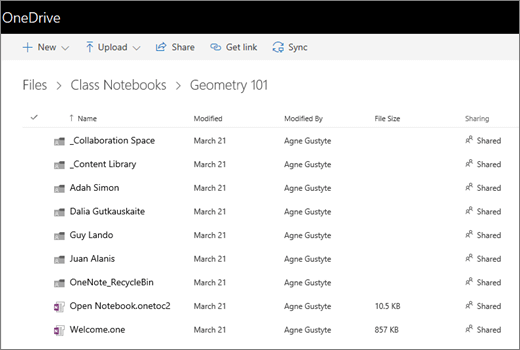 To view your Class Notebook folder structure in OneDrive, sign-in at Office.com. Paste the URL into a program such as Notepad. You’ll come back to it in a moment. Copy and paste this URL into your browser to view your Class Notebook folders in OneDrive. Visit the answers forum if you need more help with OneDrive or your Class Notebook.